This is a post I’ve resisted writing for ages, because it’s just SO simple and SO easy, that as a blogger I can’t help but feel like I’m “cheating” making a post out of it. This has happened to me before of course, and every time I post one of these simple + easy recipes, I’m always flooded with comment of THANK YOU and MORE PLEASE. Because duh, who doesn’t want simple + easy? Of course you guys appreciate that! Which is why I’m finally posting this very, very special recipe. A recipe so special that it is, hands down, the most loved and the most commonly eaten food ’round these parts. Waits loves it because it’s quick, always at the ready, and totally delicious. And I love it because it’s a super nutritional powerhouse, packed full of protein and healthy fats and lots of essential vitamins and minerals. Honestly? I think it’s sort of the perfect food for growing vegan children. Magic Beans can be made with any kind of bean! Waits loves kidneys best, and I love lentils. And I can’t even recall the number of times I’ve posted this recipe across the internet – in vegan parenting groups (every single one I belong to, multiple times) and in emails, on Facebook, Google + and Instagram, over and over and over I post this recipe. Because it’s perfect! Protein is so important for growing bodies, and healthy fats provide calories, energy and form the foundation of nervous tissue. Fats are also essential for proper brain development and hormone function. So … kiddos need those fats! Each kind of bean provides it’s own unique micronutrient profile, but most all beans are high in iron, magnesium, folic acid, and B-vitamins (not B12). And of course, there’s the nutritional yeast. Nutty and cheesy and oh-so-yummy, nooch also packs a nutritional punch, offering tons of protein, zinc, B-vitamins, and the ever-elusive vitamin B12. And perhaps the best part of all about Magic Beans, is that they require no cooking, no forethought, and only about 2 minutes to prepare from start to serving. You can’t beat that! 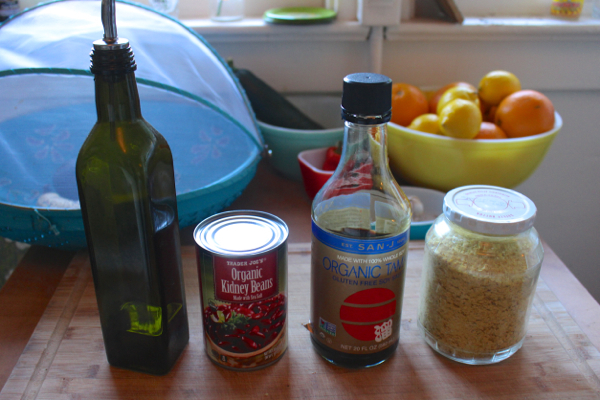 Magic Beans have just 4 ingredients: beans (drained and rinsed), nutritional yeast, olive oil (or hemp oil or avocado oil or macadamia oil or another healthy oil of your choice), and tamari/Braggs/soy sauce (or just salt if you prefer). 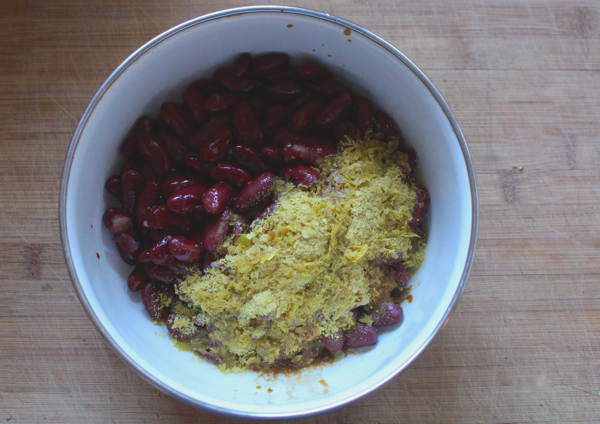 To prepare, place 1 can of rinsed beans (or equivalent lentils) in a bowl. Drizzle with oil, I use probably 1-2 tablespoons but really it’s up to you. Add the nutritional yeast, somewhere between 1-3 tablespoons. Then drizzle or spray with tamari/Braggs/soy sauce, to taste. 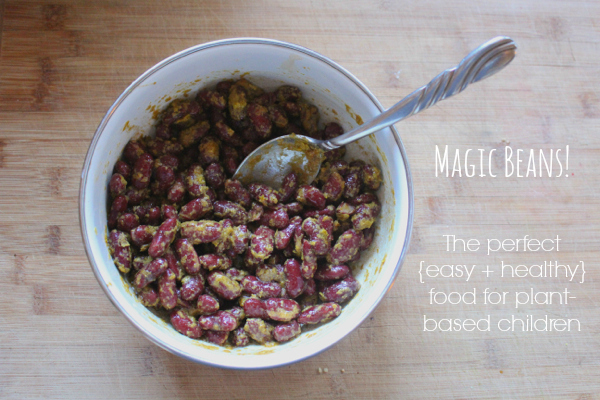 Finally, feed the resulting goodness to your favorite weegan — or wee non-vegan, they love Magic Beans too! In fact, we’ve pretty much gotten our entire preschool hooked on the stuff, because it’s just so dang tasty, and so dang healthy! And around the house, we eat Magic Beans as a snack food, as an “appetizer” (you know –> “MoooOOooom I’m hungry now!” <-- while you're making dinner? This is great to hold them over, because even if they fill up on it, they've eaten something totally well-rounded and meal-worthy), and often as a main component of our meals (both lunch and dinner) (and okay, sometimes breakfast too - the cold leftovers are great in the morning!). For example, a common dinner is Magic Beans, homemade mac and cheeze, and a raw veggie plate. Or an example lunch might be Magic Beans, coconut yogurt, fresh red peppers, snap pea crisps, and a few strawberries for dessert (Other sample lunches with magic beans, here and here). Yes, we eat a lot of them. What can we say? We LOVE our Magic Beans! And now, I want YOU to tell ME! What’s your simple + easy superstar recipe for vegan kids? Let’s help each other out, and share in the comments below! Just wondering: why not use dried and homecooked beans instead of canned? It can be just as convenient if you make a large batch and freeze. Thanks! I love quick meal ideas. There are times I need something quick and I make a processed (vegan) food, great to have a whole foods alternative, or something to make a salad more of a meal. I don’t have kiddos, but my inner child LOVES the classic PB&J sandwich. I use Trader Joe’s *new* vegan sprouted wheat bread (bigger slices and tastier than Ezekiel bread, imo), organic peanut butter made only with peanuts (TJ Brand), and strawberry jelly sweetened only with fruit juice (I like Polaner Brand). I eat one for lunch at least 3 times a week. It’s easy, filling, tasty and comforting! I’m excited to try Magic Beans! My fiancee and I have been eating hippie bowls with the raw tahini sauce at least once a week since you posted! YUM! I could go on and on about food…. Hi Kim, this recipe works just as well with home-cooked beans, so feel free to sub! The reason *I* don’t use them though, is all about convenience and variety. Convenience, because this meal is a 2-minute meal which I make very often, and frozen beans would mean thawing, and that would negate the quickness/spontaneity of it. And variety, because we eat a LOT of beans around here, and we like to keep things diverse. Waits likes kidneys in his magic beans, I like white beans in my salads, we do black beans in our tacos, etc. Keeping a pot of cooked beans in the fridge – which I’ve done in the past – means you only get to eat one kind of bean at a time. At this point in my life I just want more ease and convenience. But please – feel free to use whatever works for you! A can of beans is about 1 1/3 cups, if you’re looking to sub in home cooked. Have you tried the TJs fruit juice-sweetened jams? They’re organic and reasonable priced – we love them! As a fellow grad student, I also totally understand the convenience of canned beans! 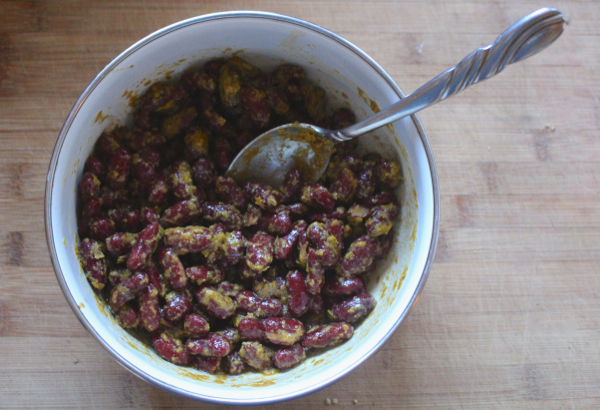 Every once and a while I can make a batch of dried beans, but canned is just so easy. I’ll definitely be taking some magic beans into the office for lunch soon. I have tried them. So good! Polaner tastes better to me, though. They are non-gmo. It’s a weird toss up between non-gmo Polaner and organic from TJ’s. Thoughts on which is better for people, animals and the planet? I saw you mention Magic Beans on your Facebook page and tried them. My 2.5 yo refused to taste them (he’s in *that* phase right now), but my 6 yo immediately loved them and asked for more, more and more please. And just like that, it instantly became a staple for her school lunches. So yeah, I’m one going to say thanks! And, again, please post about those easy recipes, because in the end, they are the ones that people like me (aka full-time job working mother of 2) are more likely to try and use…! PS: love your blog, always. I made a version of magic beans for lunch today! Black beans plus wagon wheel pasta, my friend’s INCREDIBLE Persian Lime evoo, shoyu, nooch, and hemp hearts. So yum! And kiddo loved it too! I totally get where you are coming from on convenience- I don’t make beans from scratch nearly as often as I should. 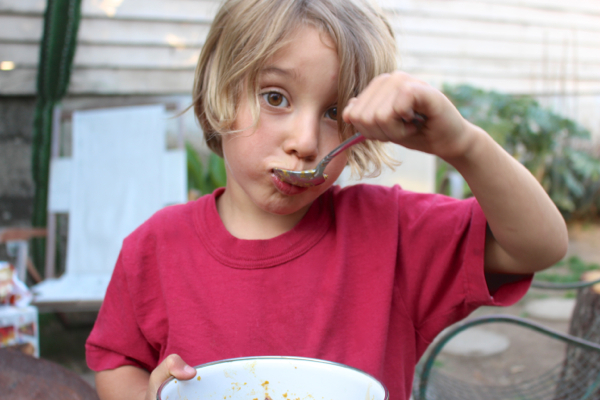 Have you read all the research on BPA and development in children though? I thought it was a lot of media hype until I actually read all the scientific literature on it recently as a project for school. I think you might be interested in it as a biologist. Just throwing it out there since I know you are in grad school! Absolutely! That’s such a good point. I’m very cautious about BPA and do everything I can to avoid it. 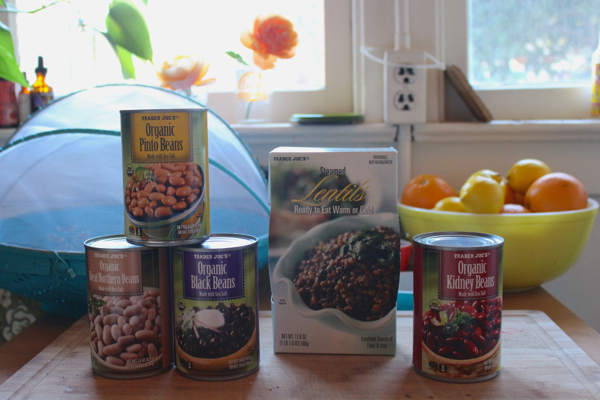 Just a heads up, ALL the Trader Joe’s canned beans are BPA-free! It’s awesome that there are [relatively] cheap and organic BPA-free options that are pretty readily available. I know not everyone has access to TJs, but it’s a good start! 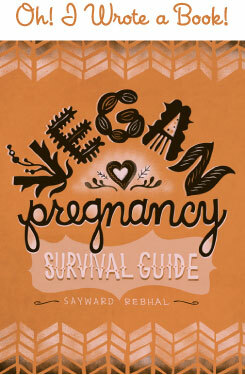 Totally love the recipe, Sayward. It reminds me of a similar cheezy dish I’ve made with chickpeas and kale but yours is still so much easier! No cook! Thank you so much for this recipe. I am retired, I have turned totally plant-based, and after a LIFETIME of cooking for myself and others, I am done! I want easy, simple, nourishing recipes. I do best on high protein – thank goodness vegan protein does the trick as well as animal-based. When I see the “plant based experts” recommending a lunch of brown rice, veggies and a scant 1/2 cup of beans, no oil, I know I would feel exhausted with such little protein. Healthy fats and plant based proteins keep me going for hours. Thank you so much for this simple, delicious recipe. Whoa, really?! They don’t say it on the can! Unfortunately, in my research I found that BPS (that’s what they replace BPA with in BPA-free products typically) is likely just as bad as BPA. It seems like you either avoid it completely (make beans from scratch) or make peace with the endocrine-disrupting risks. I need to maintain a sense of normalcy and not drive myself nuts over every single thing, but I was shocked at the overwhelming body of evidence on BPA. I assumed to find it was a lot of media hype with a few nuggets of truth, but I was wrong about that. It’s not something like artificial colors, where there are a handful of studies that show it may have harmful effects, and you may want to avoid it. We are talking hundreds of animal studies and over 100 epidemiological studies (RCTs would be unethical of course). I’m definitely thinking about a major life overhaul/BPA purge. Just tried this. THIS CHANGES EVERYTHING, WOMAN! Holy smokes! Sometimes I’ll mix beans with Trader Joe’s Goddess dressing too (which is actually Annie’s brand, I believe.) Actually one of my favorite salads consists of greens with black beans, Goddess dressing, and nutritional yeast. So good! When I first started watching him, he wouldn’t eat a single vegetable. By the end of our time together he would even eat kale salads if I called it “sour apple salad”- kale chopped pretty small, massaged with olive oil and lemon juice, and mixed with chopped apple and dried cranberries. It’s all about the name and presentation! Oh.My.Goodness. 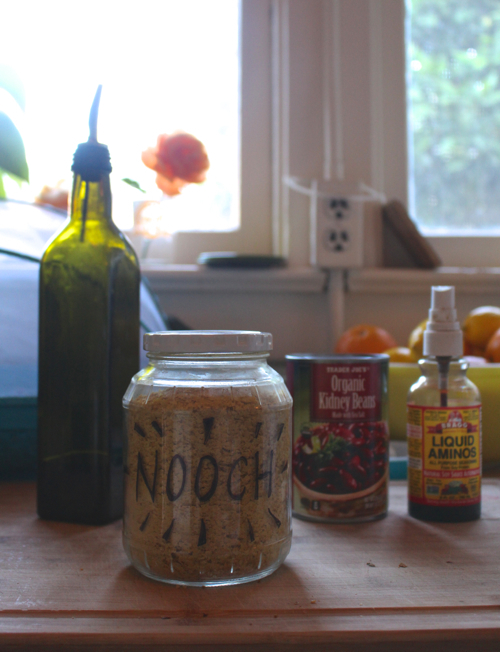 Just ate an entire can of beans using this recipe (plus a few drops of liquid smoke). Yum. Magic beans have been a life saver for me! Thank you for posting this. I often make a big batch at the beginning of the week and have them ready for my son’s lunch or busy weeknights. He also loves tofu egg salad. I make a huge batch of this to be used for salads and sandwiches. These have greatly helped me increase my bean intake; thank you! But I have a lot of trouble digesting beans: I get very bloated just a few minutes after eating even a little, and I stay that way for hours, often the rest of the day. Do you have any suggestions for alleviating this problem? Thanks. I absolutely love beans, but have the same issue with bloating, and swear by Bean-zyme Anti-Gas Digestive Aid. I am not vegan, so I use the non-vegan formula, but the same company also makes a vegan version, and I *think* the only difference is cellulose in the capsule instead of gelatin, so it should work similarly. I guess you’d just have to do a little digging to determine if it’s a good option for you. Gonna try this out for some lunches this week and I know this is gonna a little… silly but do you eat these warm or cold? Or both? I just wanna know if I can heat these up okay. I’m a meat eater at the minute but I would love to really cut down on my consumption. Weirdly enough the only non-vegan thing I eat is actually meat, I don’t use any other animal products. Your website is gonna be invaluable to me in the coming weeks. Hi Elle, so sorry to answer this a little late, but to answer your question – we eat it cold! It’s not cooked, just tossed all together and served. Of course, you could heat it or cook it if you wanted to. But we do it cold. I just made these. Actually, I managed to mis-read the directions and left out the oil. Yeah, they were delicious anyway! Next time I will use just a little of the cooking water instead of oil. <3 thank you for sharing! My 14 month old weegan is teething and has been so fussy, but he LOVED these. We make our own raw flax crackers, which he enjoys with some smashed avocado, turmeric, hemp seeds and a pinch of sea salt. Also zucchini noodles. Your Facebook and site are one of my favourite sources of inspiration. Sending big love from Australia. The worked! Very picky four year old ate them. I think she would have been happier if I had “magicked” pasta, but simply having her eat them was mind-blowing. You have helped me save time and improve my daughter’s protein intake. Thank you! I just started throwing this concoction together myself, with some black beans I had cooked and frozen. I recently tried nooch for the first time and have been shaking it over everything. I put it on the beans, with smoked olive oil, and some sumac for that tangy flavor. I love the combo!